Second, take another look at the axe of an Achaemenid king as carved sometime around 500 BCE. The king’s axe from the central relief of the North Staircase, Persepolis now in a museum in Tehran. The shape of the jaw from which the blade emerges is the same as on the king’s axe, and so is the depiction of the creature’s eye. The third axe was found in the destruction layer at Persepolis. 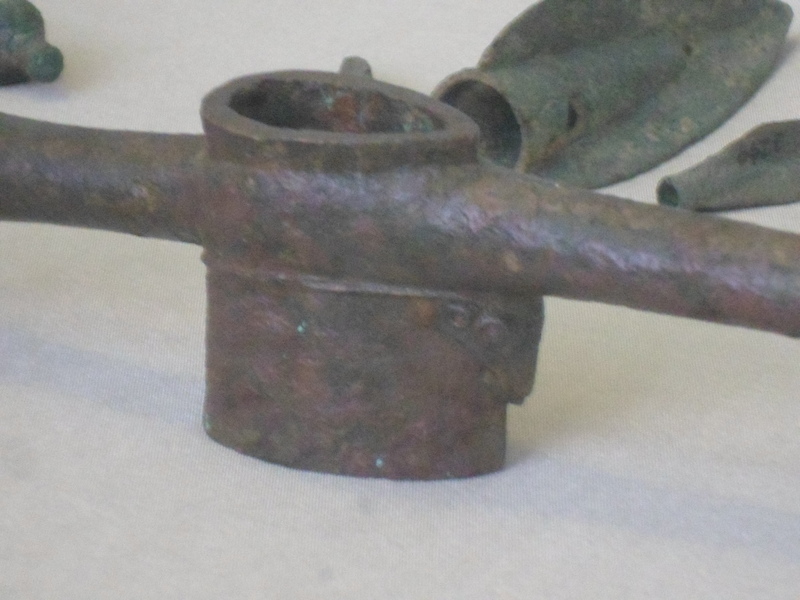 It has some things in common with the king’s axe, such as the two-pronged back-spike, and others different, such as the narrow blade and the ram’s head cast beneath the front spike where it joins the socket. This is a weapon which makes fewer apologies for being designed to smash skulls and shatter helmets, and it does not dress up the socket as a monster’s head and the spike as emerging from its mouth. A bronze axehead from the portico of the Throne Hall, Persepolis. See OIP 69 plate 78 or Curtis and Tallis eds., “Forgotten Empire” p. 234 for other photos. 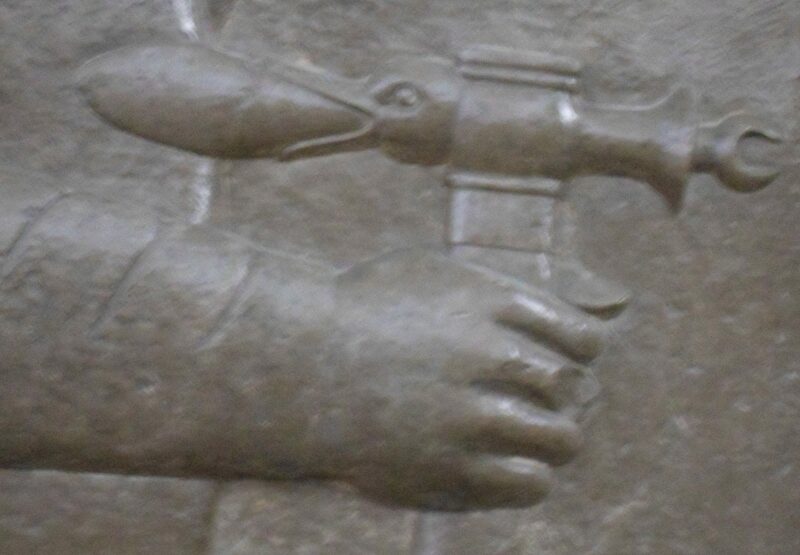 Detail of the axehead from Persepolis showing the leaf-shaped cross section of the socket, and the ram’s head cast between the blade and the socket. An axe with the same narrow head and double-toothed back shows up in the hands of a Pointed-Cap Scythian on a cylinder seal in the British Museum (number 132505). 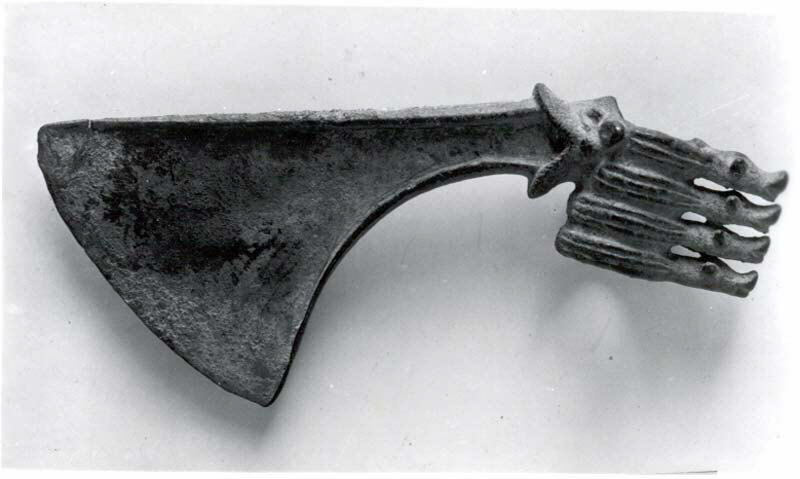 The king’s axe combines a “Scythian” or “Iranian” tradition of axes with narrow spikes for heads, and a “Luristan” or “Elamite” tradition of the blade emerging from the mouth of a creature. Given that its trendy to talk about Persian identity breaking off from Elamite in the sixth century BCE, as opposed to the Persians migrating into Parsua from the north centuries earlier with a sense of being a single people, this is not such a surprise. Further Reading: Oscar White Muscarella, Bronze and Iron: Ancient Near Eastern Artefacts in the Metropolitan Museum of Art. (The Metropolitan Museum of Art: New York, 1988). Available as an ebook here. For another discussion of Luristan see Encyclopaedia Iranica s.v. “Bronzes of Luristan.” For two axeheads similar to the third but acquired on the art market rather than from a documented excavation, see British Museum objects ANE 135142 (bronze) and ANE 135855 (that newfangled black hard metal).